What a year! I'm so very grateful for all the wonderful people I've had the pleasure of working with in 2018. Here are a few highlights that I'd like to remember. MAGELLANICA. 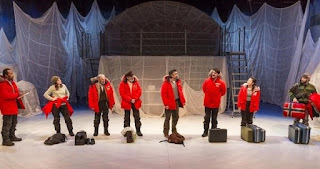 I will be forever, forever grateful to Damaso Rodriguez, and everyone at Artists Repertory Theater in Portland, Oregon, for producing the world premiere of my five and a half hour long Antarctic epic. I love this story. I've worked on it for ages... researching, writing, finding my way slowly forward, with lots of help along the way. I could not have asked for a better team, in every aspect, designers, director, crew, and my eight magnificent, brave actors. I would sit up on the back step of the theater, watching the audience watch my play unfold in front of them. Listening to them laugh and gasp. I'm proud of what we made together. And was delighted to have so many friends from across the country come and see! HOW THE LIGHT GETS IN. In January, I had a first reading of a new play, sponsored by my beloved playwriting group LineStorm, in Portland's Fertile Ground Festival. It's about a travel writer who never travels... but ends up on a journey she'd rather not be on, with three companions who are on journeys of their own. Daniel Ajl Kitrosser directed our wonderful group of actors, and I wrote and rewrote until about three in the morning the night before the reading. You know how that is? The play went on to a table reading at 16th Street Theater in Chicago (thanks, Ann Filmer! ), and then to a week-long workshop at Boston Court Pasadena, directed by the extraordinary Emilie Beck, with a fabulous cast. I wrote and rewrote and wrote some more. And I'm so happy to report that Boston Court will be premiering the play in fall of 2019, with Emilie at the helm! TOWN HALL. 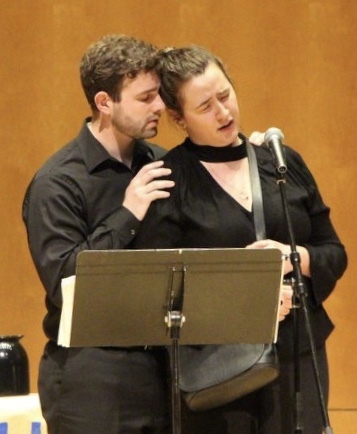 In February, I flew out to the University of Maryland, where the opera that composer Theo Popov and I were commissioned to write for the ten singers of the Maryland Opera Studio was being produced, directed by Tara Faircloth. What a grand experience! Town Hall is about a retired librarian who faces off with a conservative senator who has voted to take away her health care... right when she needs it most. I'm glad to report that this opera is going to have its second production right here in Oregon, at my alma mater, Willamette University, in March 2019! THE GREAT DIVIDE. In March, Chuck Harper invited me out to Southern Illinois University Edwardsville for a five week residency. I taught a playwriting class while I was there -- a fabulous group of young writers! And I worked on a brand new play inspired by the 2016 occupation of the Malheur National Wildlife Refuge in eastern Oregon. 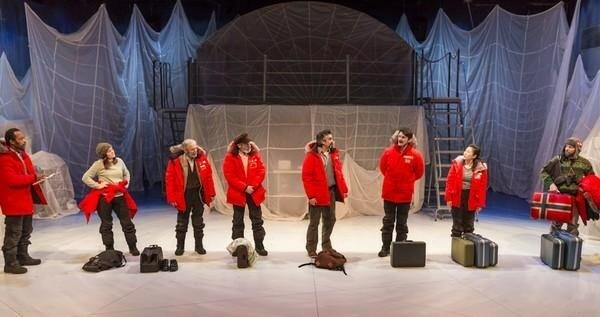 This is a play about patriotism and protest, and what it means to be an American in this divided moment. I came with 22 pages, five song ideas, and an absolute certainty that there was a play in there somewhere. 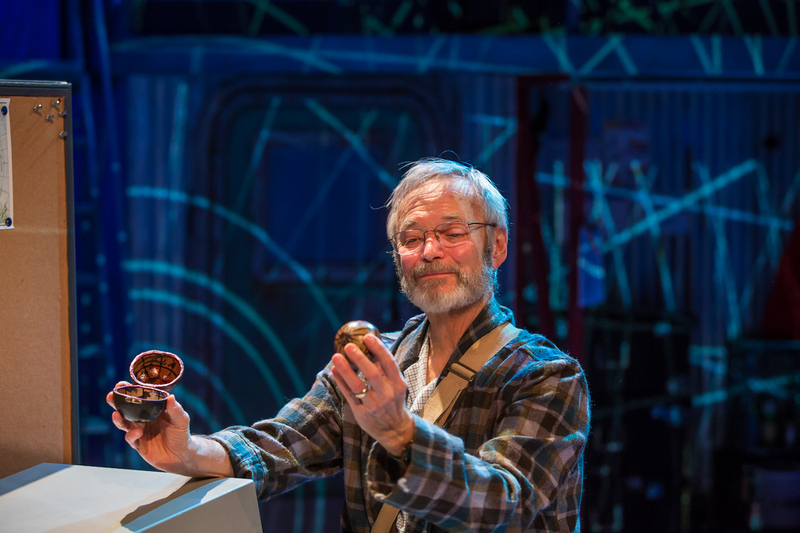 By the end of the five weeks, Chuck and I and our cast of twelve put up a workshop production of the play. It was an absolute joy to sing with these people, and be lost in the process, and have the difficult conversations that come with making art, and seeing them all up on stage. This play had the gift of further development after I got back to Oregon, when dear Michael Mendelsonincluded it in Portland Shakespeare Project's "Proscenium Live." It's not done yet, though. This is a big play, a political play, and I continue to follow where it leads me. SHERLOCK HOLMES AND THE CASE OF THE FALLEN GIANT. 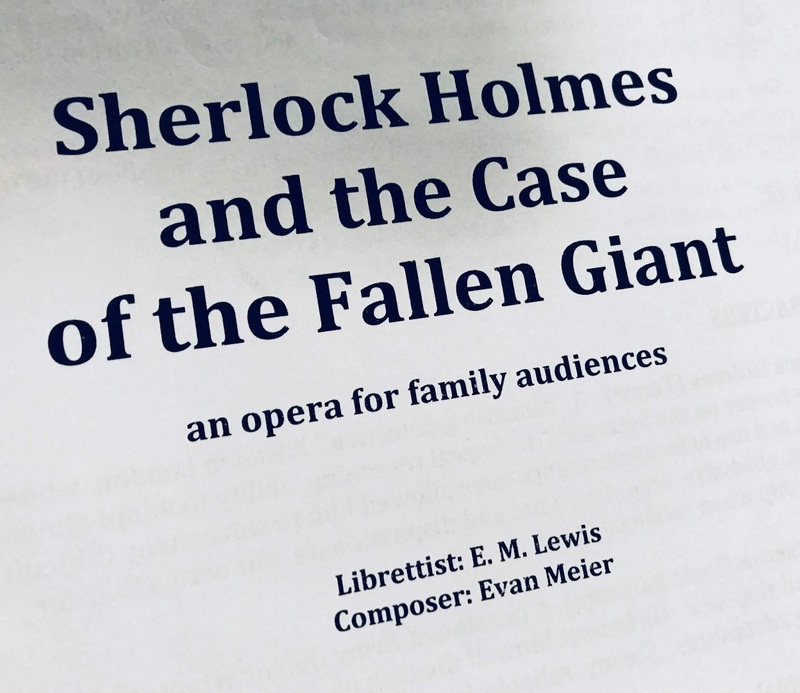 This opera is a fast and fun mash-up of Victorian mystery and fairy tale worlds, in which Sherlock Holmes and Dr. Watson solve the mystery of the dead giant in Jack and the Beanstalk. 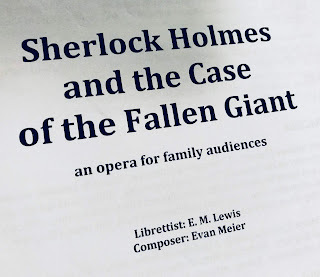 Composer Evan Meier and I continued our work on this family friendly opera in July when American Lyric Theater's creator and director Lawrence Edelson invited us to Saratoga Springs in New York for a week-long writing retreat. We did some major work on the libretto, and drafted several new numbers. We're excited to hear how it all sounds in March 2019, when we'll be in New York City for a piano vocal workshop! THE GUN SHOW. This play about guns and gun control, which is both personal and political, continued to have productions across the country in 2018. Unfortunately, it doesn't stop being topical. I'll be in Tulsa and Pittsburgh with the play in 2019, and am also looking forward to its upcoming publication! TEACHING. I did a good bit of teaching in 2018! I taught my playwriting class at SIUE, and was a guest teacher in Profile Theater's Community Profile group (which was a real pleasure). I talked with several other teacher's classes as a guest! And I began teaching playwriting workshops at Artists Rep, which I plan to continue doing in the new year. Thanks for finding a place for me in your new education initiative, Karen Rathje! Between all of these exciting theatrical and operatic and teaching adventures, I spent time with friends and family, took road trips to the coast and to Ashland, walked up and down the Abbey Hill with Sam and Augie, cuddled with Joe the Cat, planted a garden, and saw a lot of wonderful plays. I'm grateful to be able to do what I love, and live where I want, and spend time with all of you. Thank you for being part of my year! May 2019 bring joy to us all.